A neurologically impaired spokecat on a healing journey and his advocate petmom are excited to launch an Indegogo campaign to turn their small safe soap production and distribution project into a business that will keep more pets healthy and flea free. 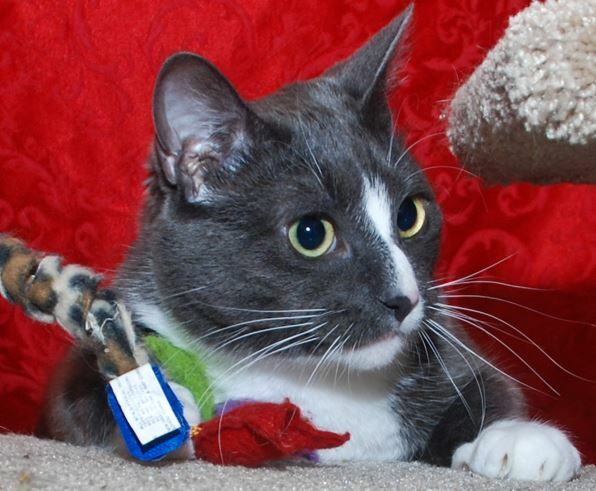 Tiny Timmy the cat came into the life of Claudia Tietze in 2009 as a damaged kitten; flea riddled, poisoned by chemicals, and with neurological problems. Claudia devotes herself to Timmy’s care and rehabilitation, while also educating the public about safe and unsafe flea treatment options and waging a campaign against the toxic flea products she blames for his neurological disorder. The vet who saw Timmy after Claudia rescued him did not expect him to live, but, thanks to Claudia’s determination to save him, Timmy lived and began his healing journey. Timmy will never be completely normal, but he has made remarkable progress in overcoming his severe neurological issues. Regular acupuncture treatments have been a very helpful part of his rehabilitation. Claudia has worked tirelessly to protect pets from the harmful OTC flea products that have harmed and even killed some pets. Along with her outreach work with the public, she has met with EPA officials as a representative of the movement to protect children and pets from toxic chemicals. when the FDA recently announced that some flea collars were being voluntarily removed from the market, their danger to children was cited. Claudia says of her greater mission: “I decided it wasn’t enough to tell people of the dangers of flea & tick products without offering a safer alternative. It’s sort of like telling someone they can’t have chocolate cake, but not offering something better. I did a lot of research and put my experience designing soaps to good use and called on my friends Johnna and Rob, the experts over at Oregon Rain Soap. They were very excited to help get our soap off the ground and work together to create the most amazing pet soap on the market! “Timmy is a cat who has neurological damage from his exposure to toxic, harmful flea and tick products. We’ve been educating folks, but now it is time to step it up a notch! We want to start a company to sell non-toxic flea soap safe for cats, dogs, kids, adults and the planet. Once we get that under our belt, we can work on creating new and safer alternatives to the harmful stuff. Check out our IndieGoGo Campaign to help us make our dream come true. 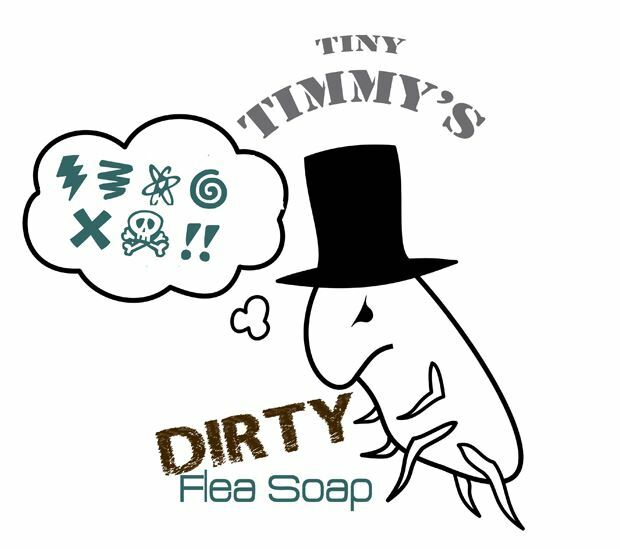 Tiny Timmy’s Dirty Flea Soap is non-toxic flea & tick soap created to minimize pesticide exposure for cats, dogs, humans & environment. Visit Tiny Tim’s educational website, Tiny Timmy.org: Educating Pet Owners About Harmful Flea & Tick Products and Safer Alternatives, along with Tiny Timmy’s Healing Journey at Facebook and the Official List of Toxins Killing Animals page at Facebook. “I could not walk and could hardly stand. I mostly just laid around. The peeps brought me a pet bed in my special room where I stayed for a while until I was strong enough to be around the other kitties. I couldn’t get into or out of the pet bed myself. I had severe tremors and muscle spasms. The peeps watched me all day and night to be sure I didn’t have a seizure. Thanks so much for covering Timmy! It’s such an important issue to offer better alternatives. Elise, thanks for addressing Nancy’s comment on the CH. The soap is also great for skin allergies and gentle enough to help heal hot spots. 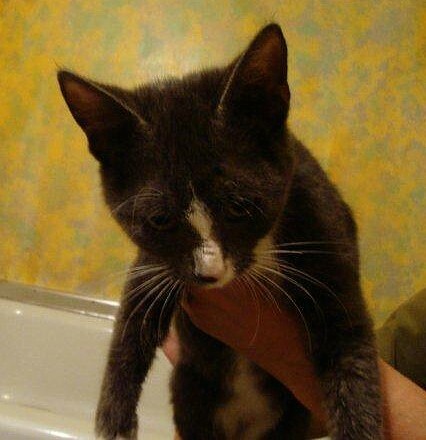 My cats, Tooga and BlueBelle were poisoned by Hartz Ultra Guard on 11/6/12. Both have permanent neurological disorders and I will syringe feed Tooga every 4-5 hours for the rest of his life. Thank you for sharing Timmy’s story and thank you Timmy for creating a great product. Claudia and Timmy have worked tirelessly for the last four years to try and raise awareness of this issue. In spite of what the manufacturers like to claim, many cases of adverse reaction were actually caused even when using the product completely in accordance with its makers’ instructions. Please contribute to their IndieGoGo campaign, or at least leave a comment. Next time, it might be YOUR pet. OTC flea and tick products hurt and kill innocent pets. If you are looking for an inexpensive and versatile product, you need to check out the Dirty Flea Soap. Stop by the IndieGoGo Dirty Flea Soap link. Contribute, leave a comment, or do BOTH! Be the change you want to see. Thank you so much for this story. Tiny Timmy is fighting to save the lives of animals. Your coverage helps advance this knowledge. Much appreciated. Love Tiny Timmy and a very worthwhile message! Love that Tiny Timmy is sharing this important info. Thank you for spotlighting Timmy. His work to save other animals from becoming ill from flea products is making people aware of what they can do to safely protect their pets.